As someone who occupied both the Executive Producer and Assistant Executive Producer's positions at The Randi Rhodes Show (at different times), Shawn's experience with the show is unique. During his time as the (Interim) Executive Producer at the beginning of 2010, Shawn was abruptly made responsible for all facets of the show, from pre-production, to technical issues, to talent direction, and website content. This all happened in the wake of a rocky period of the show - and during a contract renegotiation phase for the show. Shawn did stabilize the show and the show's contract was renewed. During this time period, Shawn also added some new pieces of daily production to the show - montages mixed with music, using cuts from recent news events, built during the normal course of a show production day. 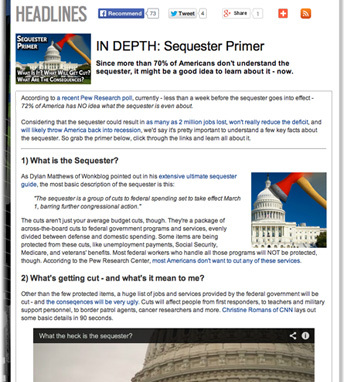 The two cuts featured below are examples of that kind of content. Shawn's hard-work and attention to detail during his temporary tenure was rewarded in January of 2011, when he was sought out and brought back to the show to become the Assistant E.P. He held that position for the next three-plus years until the show's contract was ended early, due to factors outside of his control. During his tenure as the A.E.P., in charge of on-air and interactive content, one of Shawn's regular duties was to create graphics and write content daily, in the voice of the show. 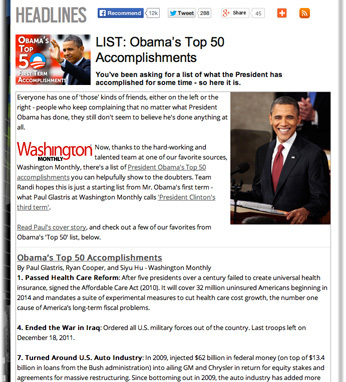 Those articles he created were to add value to the radio show, and extend the reach and interactivity of the show - for example, with the 'President Obama's Top 50 First Term Accomplishments' wallet cards that he created in cooperation with Washington Monthly. Check out the examples below to see some examples of how Shawn was able to use content gathered for the show and extend the reach and discussion of the show's listeners. "Who Really Built That Debt?" "Obama's First Term Top 50"